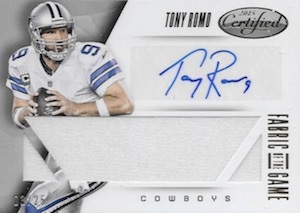 2015 Panini Certified Football is back again with more foil, a checklist that's heavy on rookies and several familiar autograph and memorabilia inserts. One of the season's earliest releases to bring a bigger amount of hits, ten-pack boxes come with a total of four autographs and memorabilia cards. The 200-card set breaks down into three sections. A total of 100 veterans makes up the main base set. 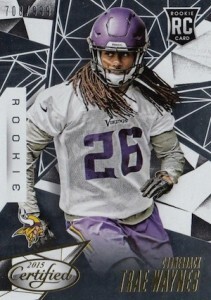 Rookies, which fall two per box, are next with 75 cards. There are also 25 Immortals, which showcase retired stars. Mirror parallels come in several colors. Mirror Silver are the easiest to find at two three per box. Among the other colors are new Mirror Purple cards that have no more than ten numbered copies each. 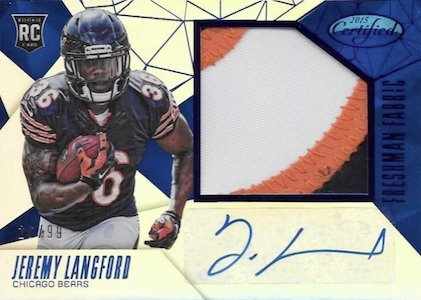 Freshman Fabric rookie autographed patch cards are one of the promised hits per box. These come with a large swatch of a player-worn jersey. Other autograph and memorabilia inserts have some returning names that have been with the brand for some time. 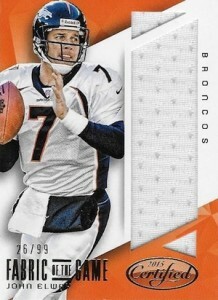 Among them are Fabric of the Game, which has Prime parallels with premium swatches that are numbered to 49 or less. Fabric of the Game has both signed and unsigned versions. 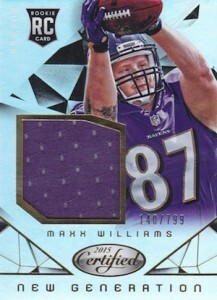 New Generation Duals have pieces of player-worn jersey from a pair of rookies. 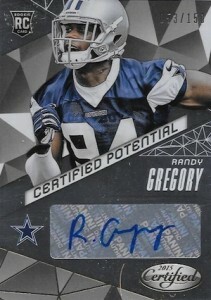 Certified Signatures has a checklist that highlights both veterans and rookies. These are numbered to 399 or less. Gold Team Signatures are also back. Numbered to 25 or less, they're not easy to find. 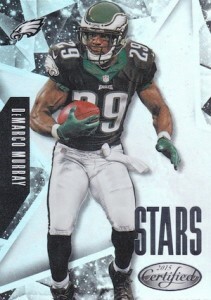 Scorching Swatches, numbered to 399 or less, is a new memorabilia insert that delivers more rookie memorabilia. Every 12-box inner case comes with a hot box that has six memorabilia cards and four autographs. AMARI COOPER 2015 PANINI CERTIFIED ROOKIE AUTO AUTOGRAPH PATCH RC CARD #41 199! View the specific prints runs with the full spreadsheet. All subjects not found in each parallel. View the specific prints runs with the full spreadsheet. 30 cards. Serial numbered #/799. 15 cards. Serial numbered #/799. *Card #1 and #5 in the Blue parallel are mistakenly listed #/19 instead of /99. There are still 99 total cards. 14 cards. Serial numbered #/399. Makes me think of the byproduct of momentum and spectre. Purchased 3 boxes and was pleased with everything they had too offer. I was even lucky enough to hit one of the hot boxes with a Jameis Winston patch 3 of 10. Along with many other great cards. I opened a full case, worst break EVER and I have done this for 30 years. No Winston auto, No Mariotta auto, No Legend auto or relics. An Amari Cooper patch auto/199 and gronkowski gold team auto /25 were best picks. Panini gets greedier every day with it’s inserts. Avoid this junk and troll ebay instead for the cards you want. One of my boxes was a hot box with a hit in every pack. There were 3 autos and 7 relics in total in the box, with doubles of Kevin White and Jay Ajayi relic cards. In summary, a lot of interesting stuff. The resale value of the top hits is easily worth half of what I spent, which is always my test for whether the product is a good buy. If I can sell the top few cards from my boxes and make half my money back or more, it gets a good grade for me on value. I think the cards look sharp too. 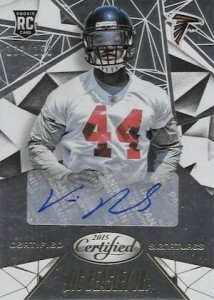 Bought into a case break for the Giants. Not a single hit unfortunately. 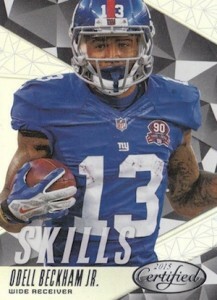 But the Giants don’t have many in this product, so it wasn’t a great disappointment. 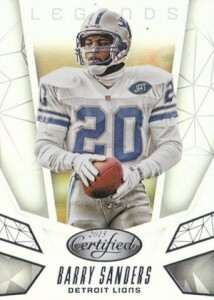 Cards looked nice in my opinion with cool low numbered inserts. The hot box did contain 10 hits (although some were repeating). But still a neat product. Earl � Thanks for letting us know. These are the checklists that Panini provides. I am not sure why they don’t actually include the correct card numbering but it seems to be a common thing. Got two hot boxes and I love them all. Puzzled me that not all rookies are serial numbered, /999. To make the complete set from 1 to 241, you have to get all Freshman Fabric set, also which is tough to pull together a set. I have opened about 15 boxes of this product in total. Things started out amazing with my first box being a hot box – 10 packs, 10 hits. The down side was nothing in the box was a “Wow” card with the best card being a Todd Gurley New Gen Patch card #/799. My second box continued the trend of being solid in which I pulled a Winston Auto/Relic #/49. After that it went downhill drastically for me. Over the span of 2 months I opened another 10-12 boxes and never pulled a hit valued above $10. On at least 2 of those boxes I only ended up with 3 hits (supposed to average 4 per). The base set and parallels are really cool along with the parallels of inserts (Gold Team, Immortals, etc…) but its harder to pull the better rookies on the hits. Overall value I would rank as low because you will rarely get value of the cards in the price per box. 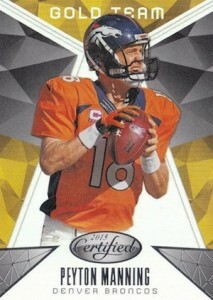 If you like parallels and retired stars, this is a cool product. 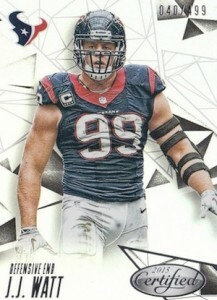 Our YouTube channel is linked through Facebook and you can watch box breaks there. The local cs’s around here don’t have a lot of choices for hobby packs so decided to stop by the Football HOF here in Canton & try my luck. Picked up my first pck of Certified since 2007 and was not disappointed. First I pulled a Bo Jackson legend red #’d /199. Hit the jackpot with a Winston Freshman Fabric 5 color Jsy/Auto #’d 10/199. Realize I was lucky but still enough for me to give it 5 stars. Hard to go wrong w 4 hits in a 10 pck box & be reasonably priced. 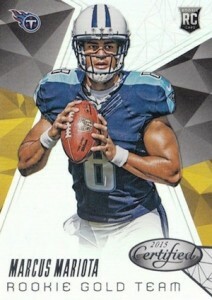 2015 PANINI CERTIFIED FOOTBALL HOBBY SEALED BOX - IN STOCK!